The weather is getting nicer and the days are getting longer – this could only mean one thing – Spring is upon us! Make the most of your Spring Break this year and create some fun family memories by enjoying a variety of the following activities in the beautiful lower mainland. Playdome is a giant carnival and midway that takes place from March 28th to April 2nd, 2018. With rides and activities for all ages, you’ll get to check out Ferris Wheels, Tilt-a-Whirl, Haunted Houses and more! March 20 - March 22: Take your children to the theatre this Spring Break! At the Evergreen Cultural Centre in Coquitlam, you’ll choose from 3 different performances – Robin Hood, Cinderella and Cendrillion – all presented by the DuffleBag Theatre company. The show is interactive and tons of fun for the whole family. 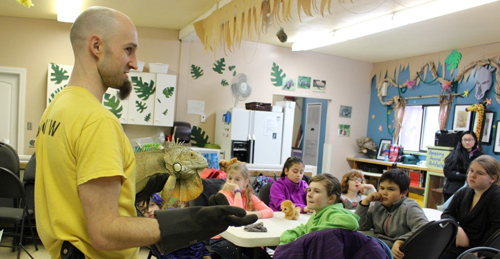 This fun and interactive camp allows your child to spend time learning what it’s like to be a real zoologist! For kids ages 7-12, the camp runs from March 19-23 and you can sign up for between 1 and 5 days. You’ll get to meet animals up close, learn all about what animals eat, how different animals find their food, and more! Daily activities also include crafts, games, learning experiences, and interactions with zookeepers to give food and toys to the animals. • Family Favourites Movies – $2.99 movies at select Cineplex theatres at 11 am on Saturday mornings. • March Break Movies – the movies Wonder, Despicable Me, Ferdinand and The Boss Baby all show at select Lower Mainland Cineplex theatres for just $2.99 (March 19-23, 2018). • March Movie Break – select movies show on weekdays at Landmark Cinemas in New Westminster from March 19th to 29th for just $3 each. • Movies at Inlet Theatre – Despicable Me shows in Port Moody on Wednesday, March 21st, and Cars shows on Wednesday, March 28th. A fun and interactive play centre that is modeled on city life – complete with a fire department, police station, restaurant, school and more! It allows kids to learn and play hands on, in a city environment for purposeful and fun learning experiences! Kidtropolis also offers Spring Break Camps for ages 5-12 years. If you have a young child that loves Marshall, Rubble, Chase and the whole Adventure Bay gang, be sure not to miss this fun interactive show. Meet the whole crew from the popular TV show from March 16-18 at the Queen Elizabeth Theatre in Vancouver. Tickets are available via ticketmaster.ca. Who doesn’t love the curiosity and incredulity of Mr. Ripley’s collection of artifacts and stories? Visit Science World this Spring Break and explore the cool collections, including the most extreme animals to have ever lived, the craziness of human biology and the seemingly impossible collection of remarkable objects. You can even climb inside the model of the world’s largest snake or see how you measure up to the world’s tallest person. Don’t forget to go outside and experience nature this Spring Break! Visit Kanaka Education and Environmental Society and tour indoor and outdoor learning spaces to see animals in their habitats. You’ll even see a salmon hatchery. These drop-in times are free and run on March 18 from 1-4pm. What a fun and great deal for the whole family! You can take up to to three children, 12 and under accompanied by at least one adult, to ride The Sea to Sky Gondola in Squamish. Once at the top, there are perfect nature trails, and weather dependent, possibly snowshoeing and snow tubing. Families can also discover various scenic viewpoints, and if you’re brave enough, a 100-metre-long Sky Pilot Suspension Bridge.